Airlie Beach is the gateway to the Whitsunday Islands and The Great Barrier Reef. It is set on a striking peninsular that reaches out into the stunning blue Whitsunday waters, just take a look. The town was once only considered a departure point for sailing holidays however it became popular as a tourist destination in itself. These days there are lots of day trips out to the Whitsundays and activities to keep you busy on the mainland. The Esplanade is the hub of Airlie Beach tourism with many resorts and hostels as well as dining spots and bars on offer. It’s located on the beach and these spots offer million dollar sea views. The waters off Airlie Beach look inviting however from November through to May the sea is full of box jellyfish. In order to provide locals and visitors somewhere to cool off the council have built the Airlie Beach Lagoon located on the foreshore. It’s a great place to swim safely and laze in the sun. Each year Airlie Beach hosts the Meredien Airlie Beach Race Week a world class yachting extravaganza. It is a week long event full of lots of activities for yachtie enthusiasts and also for those who prefer to stick to dry land. Last year's event attracted over 120 racing yachts with 1000's of crew and spectators flocking for the big race. You don’t have to be a professional to set sail to enjoy the waters off Airlie Beach as there are lots of day tours on offer so you can explore the islands and reefs. Located just out of town is some of the most beautiful National Park in Australia with walking tracks so you can explore protected coastlines, deserted beaches and lush rainforest. 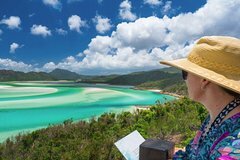 If you’re feeling really active you can do the Whitsunday Great Walk which starts from Brandy Creek and runs to Airlie Beach which is about 30km. 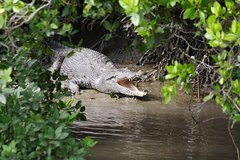 Not far from town is the Proserpine River where you can take a crocodile watching tour. You’ll see not only crocodiles but also wonderful local flora and fauna including migratory birds that call the Proserpine River Wetlands home. Airlie beach has a wide range of accommodation on offer, from the simple beds of the backpackers inns, quaint Bed & Breakfasts, modern hotels and some of the most luxurious holiday resorts. Airlie Beach is an incredibly popular place to stay due to its easy access to the Great Barrier Reef, as well as many different activities through the mainland. The Marina keeps the town a bustling hot spot of yachts and motor boats that stop in for the berth, seafood restaurants, bars, nightclubs, shops and markets.